The practice of royal patronage established by Sancho el Mayor to encourage the development of the pilgrimage road was certainly a trend continued by his successors. Sancho Ramirez who ruled Aragon from 1063-1094, (as well as Navarre from 1076), lifted the tolls on the Pamplona and Jaca roads for pilgrims and established the towns of Estella and Puente la Reina. The location of these towns helped to fix the route of the pilgrimage way definitively. The expansion of both towns was so rapid that by the time the Pilgrim’s Guide came to be written in the mid twelfth century, they were significant enough to be mentioned as way stations on the road. Estella came to rival Burgos as a centre of commercial activity. As the floodgates of the Pyrenean passes opened in the twelfth century, foreigners from beyond the mountains were encouraged to settle the new towns which acquired distinctive quarters inhabited by these emigrés. Pamplona, which had previously been abandoned as a royal city, was divided into three neighbourhoods; the Navarreria was home to the native population, the Juderia was the Jewish quarter and the Burgo San Cernin was colonised by Franks encouraged to settle through generous grants and prospective commercial prosperity. Like Puente la Reina, Sanguesa was a town built beside an important river crossing used by pilgrims, in this case over the Rio Aragon. Originally, the inhabitants were located on a nearby promontory in the defensive enclave of Rocaforte. As the threat of Saracen incursions receded, they were able to move down to the river bank. 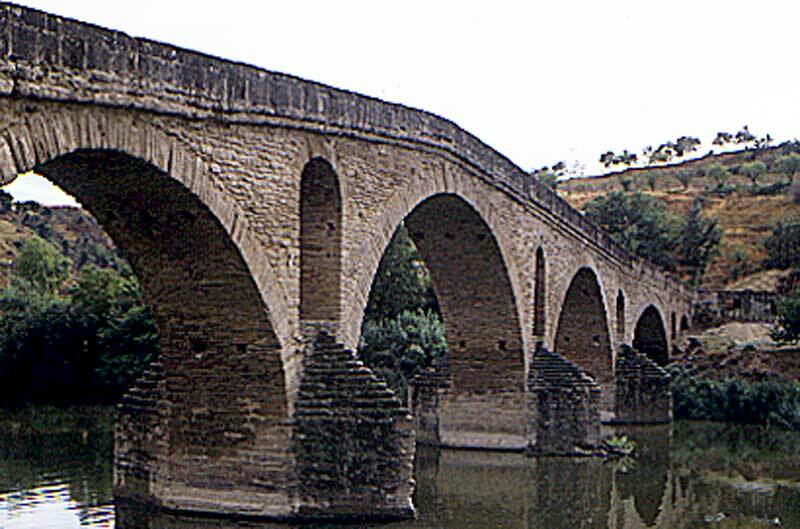 In 1122 King Alfonso el Batallador had a bridge built, simultaneously granting a fuero to encourage new settlement. A parish church, Santa Maria la Real was constructed on the left bank at one end of the bridge. By the end of the century the town comprised two parishes, the second dedicated to Santiago and was now enclosed by city walls. Between the major stations of the road, small conurbations and hamlets developed along the route next to monasteries, churches and hospices. Thus the pilgrimage was exploited to bring keenly sought prosperity to these long deserted regions. This led to the inevitable paradox. The new wealth ran counter to the very spirit of the pilgrimage. On the portal sculptures of the churches at Oloron and Sanguesa, two towns which had grown rich from pilgrim traffic, the sculpted images of the merchant and artisan classes are presented in the foreboding context of Apocalyptic scenes. Should any doubts persist, the column relief of Judas at Santa Maria la Real, rope noose around his neck, was a grim indication of the inherent dangers which were posed.